Reaching for the sky: the 30 storey Skyhaus residential apartments complex. The tallest building in South West Sydney by a country mile is almost here. 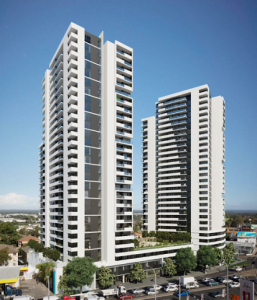 Skyhaus, a $100 million apartment complex of two 30 storey towers will set the benchmark for the entire region, which is about to receive a massive population boost from Liverpool to Camden and beyond. It was designed by influential local firm Mosca Pserras Architects. Work is almost complete on the first 30 storey tower of Skyhaus and construction has started on the second tower. A third tower of just six storeys is almost finished. As you can imagine, the views from most levels are breathtaking. Skyhaus is reaching for the sky from the Hollywood Motors site on the old Hume Highway, just past the edge of the Liverpool central business district. 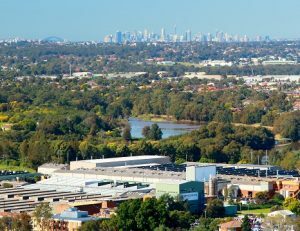 Even before Skyhaus the site enjoyed good views because of its elevated position on a crest of the hill rising from the Georges River below. 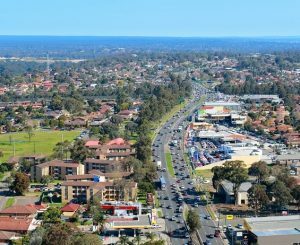 But now few adjectives can do justice to the commanding views to the Blue Mountains in the west and the Harbour Bridge and Sydney’s Manhattan-like skyline in the east. If you love good views, an apartment at Skyhaus gives you that as well as style and luxury not often seen in our region. To the east: views of the Harbour Bridge and the city skyline. The south west region boom is just getting off the ground and Skyhaus is a sign of things to come. As a landmark development it is poised to set the benchmark for residential living in the entire region. 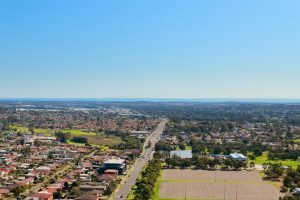 Aside from the grand views, Skyhaus is also located within walking distance of most facilities, including transport, parks, leisure centres, educational, hospital and retail and dining. Residents on the first 20 levels will be moving in before Christmas and in time to enjoy the New Year fireworks from their Skyhaus balconies. The upper levels will be available around February next year. First home buyers, savvy investors and locals who are downsizing are among the first to buy into Skyhaus. Feedback from these buyers suggests the two main factors behind their decision was the high level of luxury finishes and – not surprisingly – the incredible views on offer at this new south west region residential icon. How much does it cost? 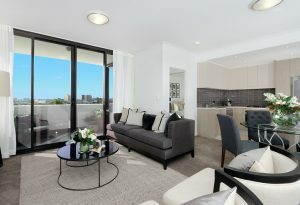 The top two penthouse levels have recently been released with prices for a two bedroom apartment starting at $629,000. • Sales enquiries are available on 1300 736 509. Skyhaus apartments offer luxury finishes as well as those incredible views. Looking towards the great south west region. Looking west, you get these grand views to the Blue Mountains.